Galapagos Islands Plastic Pollution Problem But Where is it Coming From? Approximately 600 miles or 1,000 kilometres from the west Ecuadorian coastline, a paradise of 172 islands, islets, and rocks is home for one of the world’s highest calibre of biodiversity. The Galápagos Islands, formally known as Archipiélago de Colón, is an archipelago where three different ocean currents come together. For this reason, alongside with active volcanic activities, the sanctuary is indeed a pinnacle of Utopian fantasies for all nature lovers out there. If you don’t believe me, ask Charles Darwin and his Theory of Evolution by Natural Selection. With the lack of natural predators and minimum human presence, the archipelago continues to thrive as one of the remaining beacons of biodiversity on Earth. With its breathtaking abundance of underwater life and captivating variety of endemism, Galápagos Islands were classified as a UNESCO World Heritage Site since 1978. We can save the doubts later because this nature’s wonderland is undeniably deserving for its label as “a living museum and showcase of evolution”. Despite the isolation and richness of the archipelago, it was left not exempted to the attack of the most notoriously hated species on Earth – trash. Is there anything more horrifying than unwanted rubbish visitors reaching the most delicate and fragile sanctuary in the planet? Is there anything more heartbreaking than seeing the innocent creatures of the islands suffer from trash invasion? You know what, we can’t let this happen. Definitely not! So Where Does The Plastic Pollution Come From? Aren’t you wondering how plastics come ashore to these islands if 90% of it is banned from human settlement? Blaming it to 27,000 local inhabitants or 230,000 annual tourist visitors will be an understatement. Because plastics from all over the world are reaching these coasts through the same ocean currents that brought magic to its “melting pot” for marine species. Plastics and other waste products like shopping bags, plastic bottles, straws, batteries, and even televisions will be seen hunting the coasts. Plastic invasion in most popular island shores is depressing enough, but plastics in the most isolated islands of Galápagos with nearly a zero human footprint is another level of horrifying! Even after a cleanup several months earlier, 2.2 tons of garbage items have been collected from these islands accessible only for some months of the year because of brutal tides, including 8,000 plastic bottles. Most of it is foreign coming all the way from China, Peru, Japan, Panama, Turkey, Mexico, and England. The former head of the Galápagos National Park, Walter Bustos, emphasized that these plastics should be traced back to its manufacturers and let them “pay for the cleanups”, and “sending the plastics back to its rightful owners”. To further emphasize the kind of horror brought by our rubbish visitors in the islands, let me give examples. Sea lions of the easternmost island of Galápagos archipelago, San Cristobal, have been found struggling from plastic bag entanglement. Giant tortoises of Santa Cruz have been positive for plastic ingestion after pooping plastic debris. In some islands, lava lizards and centipedes have found their “death trap” inside a plastic bottle. Goose barnacles are even found living on floating plastic bottles without knowing that they’re like digging at their own graves. Some plastic rubbish is also found weaved in the nest of Darwin’s finches, which could mean death to its hatchlings. This alarming threat made Galapagos Islands be included in the list of “At Risk” World Heritage Sites last 2007. With 53,280 square miles or 138,000 square kilometres of the established marine reserve, efforts have been made to keep the beaches clean. 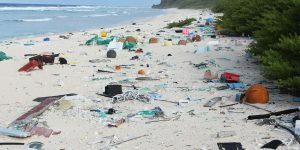 In fact, 22 tons of garbage were collected through the coastal garbage cleanup spearheaded by the officials of Ecuador’s Galápagos National Park since January of this year. The most populated island of Santa Cruz was successful in recovering and recycling 45% of its solid wastes. In 2015, the authorities banned plastic bags with handles from entering the islands. The local fishermen are trashing the idea of plastic nets and even fishing and diving for plastic trash to keep the waters from contamination. Sympathy from the social networking community also reached the islands, promoting total ban for disposable plastics and encouraging the restaurants to stop using plastic straws. The country of Ecuador also joined the UN’s Clean Seas Campaign, which is known today as the “most ambitious effort to tackle marine litter”. With continuous efforts of people from different walks of life, we can still protect the wealth of the Galápagos Islands. We can’t always visit the place to participate on cleanup drives, but we can always rethink about our overconsumption of plastic-based products. Don’t forget that plastic outlives any species of this planet. Who knows, you might be murdering one of the 2,900 species of Galápagos because of the plastic bottle you just trashed.